Benedict funeral Directors Ltd is owned and run by Joseph Wills and dad Peter. * We are the best value funeral service around without compromising on the service offered and our own high standards. * We offer a genuine personal service that is both caring and honest. * Our prices are hard to beat and our service is of the highest standard. See our website for more details. * We have a a fine Chapel of Rest for family to spend time with their loved one. Unlike some funeral Directors use of our chapel's of rest is always included in our service, no matter whether you pay for a luxurious funeral or a basic funeral. * We offer a white or black horse drawn hearse, a motor bike hearse or our traditional hearse. * Eco friendly funerals are available. Spending time with your loved one is something a great deal of people request prior to the funeral. For this reason we include the use of our Chapel of Rest as part of our service to you. This mean the price we quote you for undertaking the funeral arrangements automatically entitles you to use one of our Chapel of Rest; you don't pay extra. Funerals are and should be specific to the requirements of the family of the deceased. Many people state when they die they want their body taken back to their country of birth for burial. As you would expect the laws surrounding this can be challenging. We are more than happy to provide this service for you. Please contact us for further information. This will naturally follow the criteria of the religion / faith. For example if your loved one was a devout practising Roman Catholic you may wish his/her body to rest over night in the Catholic Church in front of the tabernacle, with the Requiem Mass following the next day. After this your loved one will be transported to a local burial site or to a crematorium. Sometimes people request the crematorium service to be for family members only (but not always). Rest assured we will work closely with your religious minister to make certain the correct format of your faith is adhered too. Many people have no religious belief. This does not stop the family from still wishing to hold a farewell service of remembrance. To help families a great deal of people use a Civil Celebrant to conduct the remembrance service. The civil celebrant will tailor the requirements of the service to the families wishes. The Civil Celebrant can (if you request it) add little touch of religion, such a hymn or prayer and then keep the rest of the service about your loved ones life, the choice is yours. In today's world many people place great importance on protecting the environment that we live in, even to declaring their intent for the their final resting place. For this reason eco friendly burial sites exist. click on the links to visit theses sites. 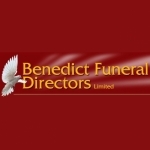 Benedict funeral Directors Ltd offers prepaid funeral plans. If you wish to purchase your funeral before your death, please go to our website and see our range of pre-paid plans. Speak to Peter for more details. We offer an extensive range of memorials/headstones. Please go to our website for further details and click on Funeral Products and then click on Head and memorial stones. Benedict Funeral Directors is proud to offer it's very own in house florist. You can order flowers for the funeral all under the one roof. Benedict Funeral Directors offer an extensive range of traditional coffins and caskets, including solid wood, veneered wood, metal and a range of environmentally friendly products such as basket and cardboard. For most people the final send off of their loved one is very important. Accordingly, you need to decide what type of funeral is best for you and within your budget. Benedict Funeral Directors can provide traditional black hearses, horse and carriages, motorcycle hearses and even camper van hearses where such transport might be preferred. As a family we were very happy with the professional service we received from Benedict Funeral Directors for our late mum Mary Moore from start to finish the service was excellent and very professional, from help with the funeral ,the Mass and burial of mum to the beautiful flowers provided! Care and compassion was shown from start to finish at this very sad time for us . I would 100% recommend Benedict Funeral Directors. Many thanks. Bernie Seamarks, September 2016 Testimonial following our mother Margaret Hutchinson&rsquo;s memorial and cremation I have to say Peter, Joseph and the team were excellent. They were kind and understanding to our needs, and our unusual requests, as we had to have the memorial first and the cremation later that day to accommodate family from overseas. Some could not be at the cremation, so we accommodated them all at the memorial, but not the cremation, strange but it worked. The team were great at helping us with that. Their prices were reasonable and not once did they ask us for money. In fact I had to phone Peter to see if I could pay him; there was no pressure. At the memorial they were there waiting to greet our mourners. They handed out our Order of Service for us and Peter&rsquo;s reading was clear and loud. It had almost a calming affect, it was wonderful, I couldn&rsquo;t have asked for better. I would not hesitate to recommend their business to anyone, they get Ten out of Ten in my book. Thank you once again.